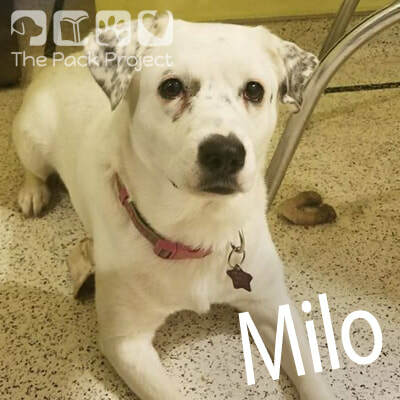 The Pack Project would like to introduce Milo! Milo has been in care since November 2016. He is not currently available for adoption. When Milo came into care he was terrified of people. He could not be touched at all. He preferred to hide under a bed and not look at anyone, except other dogs in the home. He loves female dogs! Over the past 2 years Milo has come a long way. It has taken a lot of treats, patience and trial and error to figure out how to make friends with him, and gain his trust. We don’t know much about his past. He was caught as a stray and moved immediately to a foster home as the shelter realized it was not a suitable environment for him. He has a crumpled ear and missing teeth so its hard to say what horrible things happened to him in his short life. It is suspected he is approximately a year and a half old now. Since being in care we have managed to make significant progress. He went from hiding under a bed and only coming out when people were sleeping or sitting very quietly in another room and not looking at him, to now taking treats from people, though he quickly steps backward to avoid any attempts at petting his head. He still will not let people touch him using hands near his face but his foster can pet him using her feet, and most recently can give him bum scratches with her hand! He also has learned sit, down, sit pretty and touch. A great feat considering one couldn’t talk to him when he arrived without him running and hiding under the bed. He is quite the character since his personality has started to come out. He follows his foster mom around and will touch her with his nose or put his feet on her for treats. He barks when he’s excited, like while waiting for his food to be served, or when he tries to be the play police with the other dogs! He now loves to smile! Although still very unsure of people he is learning to trust and make the best of life with people. It will still be a long while until we believe Milo will be adoptable but we will continue to share updates on his progress until he is available. Check back soon for updates on Milo! Today marks a big break thru for our long term foster Milo. He is wearing a collar! After months of letting him sniff it and him barking at it he finally has it on and is leaving it alone!! He loves his morning cuddles and pets from his foster mom and playing with his foster fur siblings. Hopefully he will soon learn that his collar means more freedom to get outside and see the world! It has been a busy couple months in Milo's foster home. He continues to make slow but consistent progress with trusting humans, and learning to wear a leash/collar. Neighbors and friends who visit can get Milo to sit and wave and take a treat from them. He is hesitant to actually shake a paw but does a great wave! He comes on command most of the time now. He also knows down and touch and is working on sitting pretty. Milo will finally put his head thru a slip lead to get a treat, but still panics when it gets snug on his neck. Its a work in progress! After chewing up about 4 collars the slip lead seems like a better option. He loves to cuddle in bed early in the mornings (only one hand allowed on him at a time) and loves to sit close to his foster sisters and his foster mom. Milo's foster home is hopeful that summer will bring a bit more time to spend specifically with him and have even better progress reports soon. ​Hi. It's Milo. My foster mom said happy 2 year anniversary to me today. I've been safe and warm in Pack's care for 2 full years now. That's a long time! I'm doing really well though. I wear a collar and leash now and get to walk around the block over and over. I can't go far because I still haven't seen the vet. Mom keeps trying to get me into a kennel, or into her vehicle but I'm still scared to be confined. That's also why I won't let anyone pick me up or put 2 hands on me at the same time. But I do let my foster mom try and get away with some things. Like when she puts this weird basket over my nose. But she gives me lots of treats for it so I let her. Who doesn't love treats?! I also love to talk now. It drives my mom crazy, ha ha. I bark in the morning, when she comes home from anywhere, when it's food time, when I'm being the play police. I have to make up for lost time when I was too scared to say anything. My neighbors that know me pretty well can even put on and take off my collar/ leash so I can go outside. I love going outside to play or walk! I'm going to continue working on not being so scared of being confined so I can get to the vet, then my mom says I might be close to looking for a new forever family. Thank you to everyone who is following my story and to those who continue to donate food and supplies to this group. I've wrecked a few blankets and collars while living in my foster home. I'm lucky to have been eating good food all because of awesome people like you. Thanks!